‘Why did you give Mannitol?’ asked the Registrar. I was told it reduced mortality’. OK, so that’s a paraphrased recollection from some time ago. Our patient had presented with a GCS of 12: CT scan showed a large subdural haematoma and on their return to the resus room they had blown a pupil. It was clear that a bridging therapy was required to get the patient to theatre, and so we chose to use mannitol. It seemed a reasonable approach at the time, although that view did not appear to be shared by everyone and as the reg said, other units were practicing in a different way. Such experiences can be challenging and I’m sure every emergency physician is familiar with the experience of feeling out of date when their practice is questioned. It doesn’t mean we have to be defensive, a challenge to practice is an excellent opportunity for learning something new. Arguably this situation was one of the original drivers in setting up the BestBets project. BestBets are designed to help us understand the quality of evidence for what we do or to challenge the dogma we might experience from others. At the time it was surprising to discover just how much of our practice was based on shaky, or on many occasions, non existent evidence. 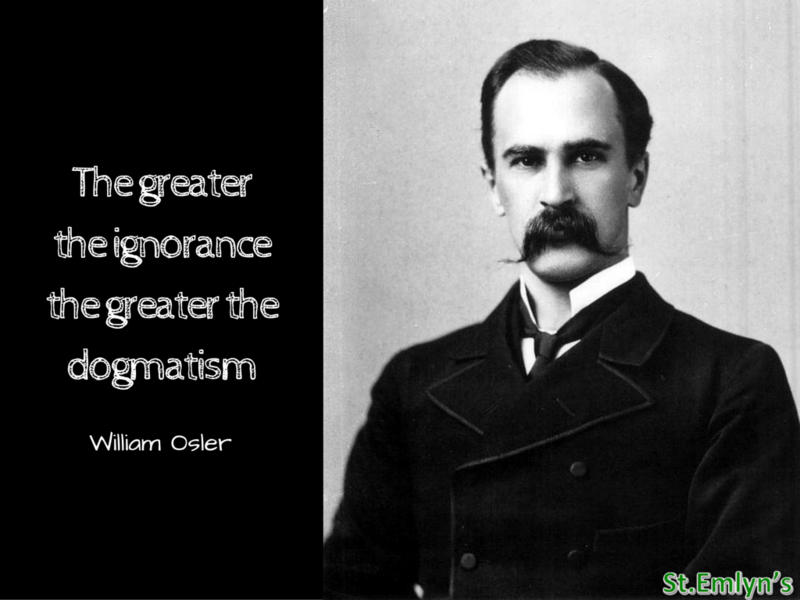 Of course this is nothing new, William Osler succinctly summarised the relationship between evidence and certainty. Of course, it is far too easy to be cynical about the use and abuse of evidence. Whilst we might be tempted to mock our colleagues in other specialities we are just as guilty with our experience of publishing over 2000 BestBets reminding us that a lot of what we do in the ED is based on a rather shaky foundation. So what should you do if you are challenged about your practice? My advice would be to be polite, to ask if they have any up-to-date guidelines or papers, and then wander off to have a look for yourself, or if it’s an interested trainee help them look and collate the evidence. It’s potentially a good question for a CTR or BestBet. The question is important: raised intracranial pressure following head injury is strongly associated with mortality, and hyper-osmolar therapies have been around for many years. Mannitol is traditionally the most commonly used, but concerns about the subsequent diuresis and the initial volume required to create an osmotic effect have led some to use hypertonic saline as an alternative. My colleagues in ICU have sometimes expressed a preference for HTS because of the volume issue, especially when repeated doses are needed. The bottom line is that there is controversy over the best method to reduce ICP in patients with head injury. Luckily, my automated PubMed search drops a little beauty into your inbox, which might just help answer your question. There’s a great review of this paper on the Skeptic’s Guide to Emergency Medicine. Whilst I’ve jotted a few notes below, the detailed review by Ken Milne is really worth a read and a listen. What type of paper is this? Serendipitously, this is a systematic review and meta-analysis so we are hoping to find a comprehensive search, review and analysis on the use of hypertonic saline in severe traumatic head injury. Systematic reviews should have a clear focus. This encourages a focused question that then leads into a definitive search. This paper does this by focusing on the use of HTS. In a systematic review it’s important to look carefully at how the authors identified papers. We’re looking for something more than a quick MEDLINE search. Here the authors looked at a number of databases, then also looked at the grey literature through specific databases. Finally they hand searched the references in the papers they did find. Arguably there are further steps that could be taken to ensure that the grey literature is addressed: conference abstracts, contacting authors and companies, or looking at trials registers are alternatives, although their ‘grey literature’ searches may have covered these. What was studied (the papers), and were they any good? In a clinical trial we are really interested in the patients, similarly in a systematic review we want to know the detail about the papers. The authors specifically sought randomised controlled trials (RCTs) which is appropriate. This is a therapeutic question and an RCT is most likely to give us the answer we need. However, it’s not just the design, but the quality that matters and it’s good to see how they addressed this using the Cochrane bias assessment tool. Their search found 506 papers of which 11 papers, involving 1820 patients, addressed the core question. How did they collate and summarise the evidence? Only 9 of the 11 papers had mortality data and so only these were used in the analysis. There is always a concern in any meta-analysis that when combining trials problems arise because there are fundamental differences between the trials. This can be looked at clinically (do these patients look similar across trials) and also statistically using a measure of heterogeneity. In studies just looking at changes in ICP, then again only a subset (3 studies) compared against Mannitol. Again there was no mortality benefit from the use of HTS but the confidence intervals are wide and so this remains somewhat uncertain. What is surprising to me is the lack of data on longer term neurological outcomes. Surely we want to know if people recover, and recover well. I’d have loved to see some data using something like a Glasgow Outcome Score at 6 months post injury. How does this fit with previous studies? It’s clearly a real question as there are a number of other reviews on the topic. Several groups such as Burgess et al, Kamel et al, Rickard et al, Li et al, have come to similar conclusions, although some suggest a beneficial effect in terms of ICP, there is no proven mortality benefit. The latest Cochrane review favoured HTS, but based that conclusion on the same Vialet trial in this systematic review. That trial had just 20 patients and so I don’t think we can draw any meaningful conclusions from it. What does this mean for the EM clinician? Sadly, the evidence for or against HTS or Mannitol is not that helpful. In the absence of definitive evidence we are left with a reliance on clinical judgement and an understanding of how the fluids exert an effect. I like the article by Boone et al that argues that the pursuit of a single answer, whilst useful for guidelines, may be the wrong approach when the evidence is not definitive. Whilst the studies have not demonstrated changes in mortality it is apparent that the clinical effects of the two fluids is different and an experienced clinician may choose to use either based on the likely cardiovascular consequences. Different HTS solutions are in use and of course these may have different effects. Dan Horner, a St.Emlyn’s contributor and ED intensivist in West Virchester has experience of using 30% HTS in 15ml boluses for refractory ICP on the ITU, but that’s a very different proposition from 3%, 5%, 7% (and other) solutions that may be used in the ED. We need to mindful that the vast majority of studies look at changes in ICP and that is something that we cannot directly measure. Whilst indirect methods such as ocular USS can be used, it’s clearly not the same. As a result we are often treating raised ICP in the ED from a position of relative ignorance, both in terms of the decision to use osmotic agents and in gauging the response to them. Subtle changes to pupillary reaction using clinical examination, the mainstay of pupillary assessment in the ED. is probably unreliable. This lack of accurate ICP data when using drugs designed to alter ICP is always going to be a risky strategy. If this is a question in your practice then the best advice I can give is to build a relationship with your local neuro-centre, most notably with the neuro-anaesthetists who will be looking after the patient following transfer. Perhaps the most surprising finding on this question is the large number of systematic reviews that fail to find a definitive answer as a result of the paucity of high quality trials. For such an important clinical conundrum we really need an answer. Sadly, I was unable to find any such trial on trials.org. I suppose that there may be difficulties in funding such a trial without a new therapy or commercial interest to drive it, yet clinical equipoise exists and this might be really important! Perhaps we will never know for sure. For now, if you are challenged about your choice, smile sweetly, stay polite, get their email address and send them this blog and a link to Ken Milne’s review on the SGEM. It’s all #FOAMed and so it may be really helpful in getting the conversation going. Finally, and perhaps most importantly, never forget that the patient in front of you is trying to die and they are unlikely to be definitively managed in the ED. Osmotic therapies in head injury are always going to be a bridging mechanism to more definitive care. Don’t spend too much time debating which fluid may or may not be better as the evidence is not really there. The bottom line appears to be that if osmotic therapy is indicated then give what your local teams are happy with and get moving. Don’t forget to head over to the SGEM to listen to Ken Milne’s excellent podcast on this paper. Neuro Anaesthesia and Critical Care Society of Great Britain and Ireland. Burgess S, Abu-Laban RB, Slavik R, Vu EN, Zed PJ. A Systematic Review of Randomized Controlled Trials Comparing Hypertonic Sodium Solutions and Mannitol for Traumatic Brain Injury: Implications for Emergency Department Management. Ann Pharmacother. 2016 Apr;50(4):291-300. doi: 10.1177/1060028016628893. Epub 2016 Jan 29. Kamel H1, Navi BB, Nakagawa K, Hemphill JC 3rd, Ko NU. Hypertonic saline versus mannitol for the treatment of elevated intracranial pressure: a meta-analysis of randomized clinical trials. Crit Care Med. 2011 Mar;39(3):554-9. doi: 10.1097/CCM.0b013e318206b9be. 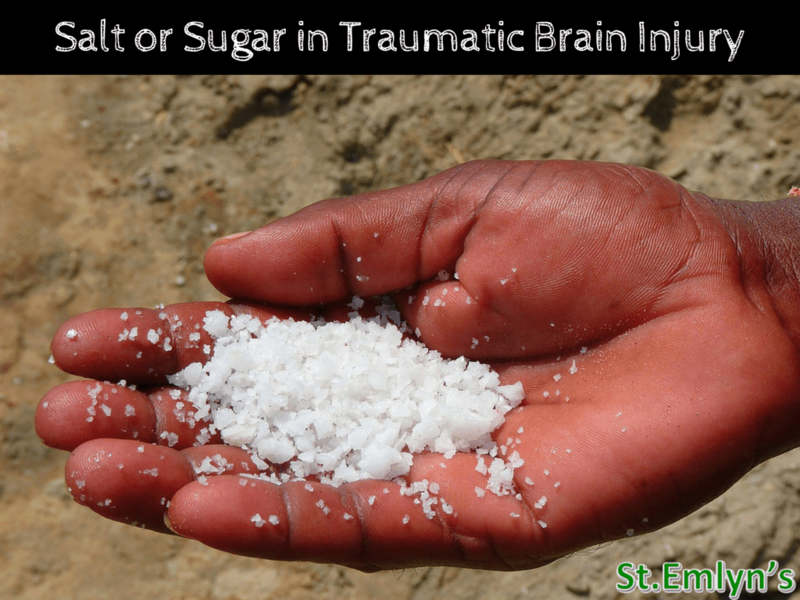 Rickard AC, Smith J, Newell P, Bailey A, Kehoe A, Mann C. Salt or sugar for your injured brain? A meta-analysis of randomised controlled trials of mannitol versus hypertonic sodium solutions to manage raised intracranial pressure in traumatic brain injury. Emerg Med J. 2014 Aug;31(8):679-83. doi: 10.1136/emermed-2013-202679. Epub 2013 Jun 28. Li M1, Chen T, Chen SD, Cai J, Hu YH. Comparison of equimolar doses of mannitol and hypertonic saline for the treatment of elevated intracranial pressure after traumatic brain injury: a systematic review and meta-analysis.Medicine (Baltimore). 2015 May;94(17):e736. doi: 10.1097/MD.0000000000000736. David Couret, Delphine Boumaza, Coline Grisotto, Thibaut Triglia, Lionel Pellegrini, Philippe Ocquidant, Nicolas J. Bruder, and Lionel J. Velly Reliability of standard pupillometry practice in neurocritical care: an observational, double-blinded study.Crit Care. 2016; 20: 99. Still a lot of grey. Two und be useful in areas like ED if it worked, monitor response to interventions, accelerate care if deteriorating? Thanks Casey. I’ve updated that link. Totally agree with the comments on ONSD. Great post. I responded to you over on The SGEM blog. Sound evidence of a mortality benefit with hypertonic NaCl vs. Mannitol in adults is yet to be demonstrated as JC and others illustrate. Prior to CVC insertion, in the presence of clinical signs or CT evidence of impending herniation, Mannitol is our drug of choice (3% NaCl is not currently available in Virchester). Dose 0.25g/kg. In the Critical Care unit, West Virchester plumped for hypertonic NaCl as repeated dosing of mannitol may paradoxically worsen cerebral oedema in patients with a disrupted brain barrier. Mannitol may also exhibit a higher incidence of renal toxicity. It is worth remembering that mannitol administration is always followed by a profound diuresis. Unless mannitol doses are followed up with further volume replacement, there will an adverse effect on cerebral oxygen delivery as cardiac output falls. This then can trigger a rise in ICP from reflex cerebral auto regulation with a subsequent increase in cerebral blood volume.